At the present time, I can see that there are 65 bids on this domain name at NameJet, with a high bid of $1,700. I do not believe there is a way to see how many backorders there are at DropCatch.com, but I am sure there are many. Both of these companies will be fighting to get this domain name as soon as it becomes available in a little less than three days. 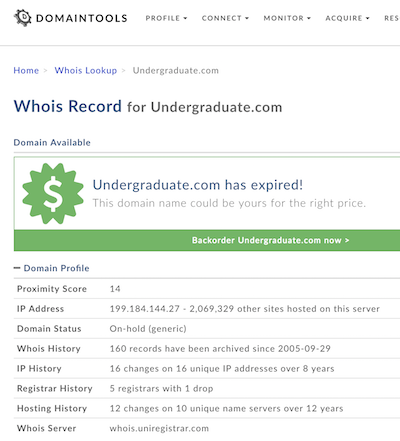 Assuming it goes into auction, it will be interesting to see if the domain name sells for more or less than before. Not that it matters a lot but where do you see the “on hold” status? And even if it is there it would be a “secondary” status. “PendingDelete” is all that matters here.